I am participating in the three-day blogging-marathon and the theme for this week is – Explore Southern Hemisphere Countries and Cuisine. When I explored Latin-American cuisine, I bookmarked quite a few recipes. But I never got a chance to post it on the blog. So took advantage of this theme and posting them all now. 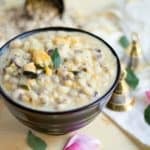 Australia is one of the major countries in the southern hemisphere and I when I asked my friend who is living there for vegetarian recipes, she suggested this steak recipe and few other baked goodies as well. I love cauliflower, and my recent obsession with vegan Worcestershire sauce made me try this steak recipe right away. It’s a perfect recipe for all the low-carb diet followers. 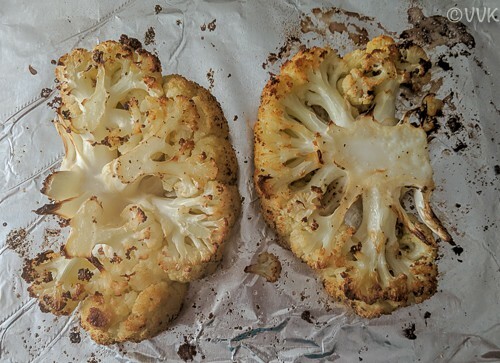 I went with the vegan Worcestershire sauce, but you can use any sauce of your choice and roast this cauliflower. 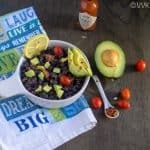 It’s a versatile recipe, and you can build and add flavors of your choice. 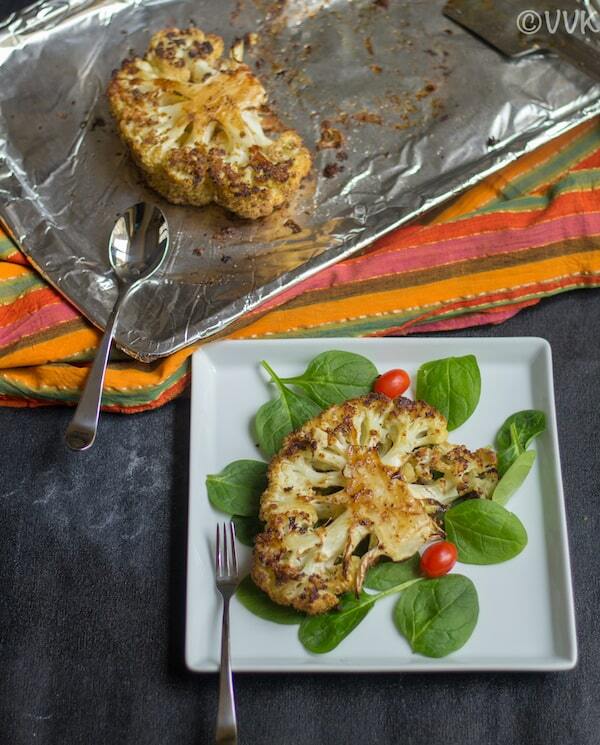 Serve this cauliflower steak with a simple spinach salad to make it a complete meal. Traditional Worcestershire sauce contains anchovies, so I went with the vegan version of the sauce. Worcestershire sauce adds that umami flavor to the recipe. If you can’t source vegan Worcestershire sauce, you can mix an equal amount of soy sauce, tamarind paste and sugar to make a quick alternative to build that umami flavor. The recipe is super simple. 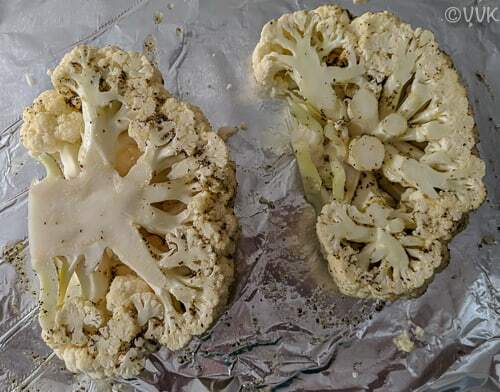 You cut the cauliflower into steaks, brush the sauce on the steaks and roast in the oven. That’s it. 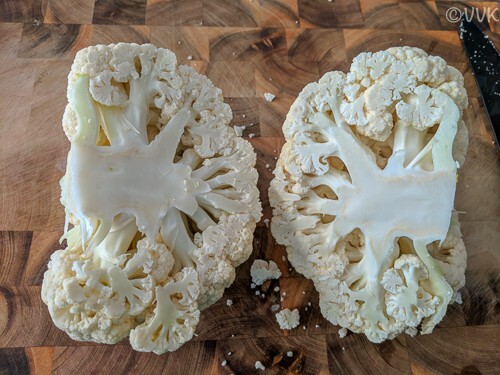 Now let’s see how to cut the cauliflower into steaks. 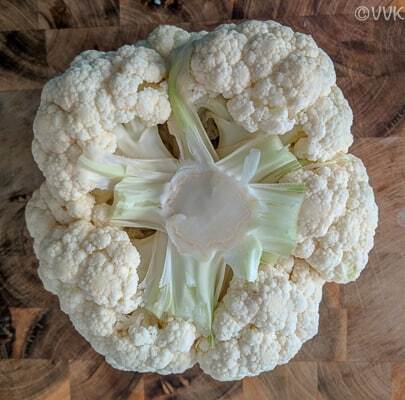 Remove the cauliflower leaves and also trim the stem, like below. Place it upside down on the cutting board. 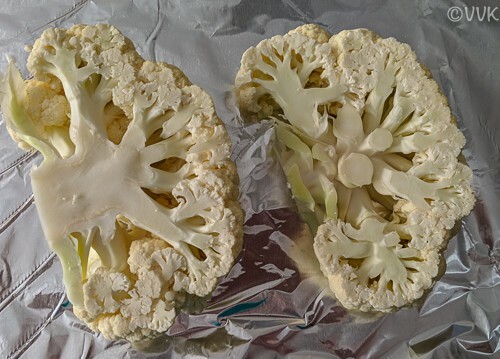 Using a large knife, cut right through the center of the cauliflower stem, and divide it into two halves. Now cut each half into two, approx. 1 1/4 inch thick slices. If the cauliflower head is big, you can get four steaks from one head. I used a medium sized one and got two steaks from it. The florets from the last slice did not stay intact. 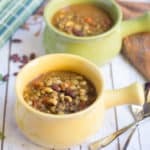 You can save them and use it for other recipes. Stay tuned for what I made with them. 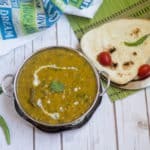 Once you have this ready, you can make this recipe in no time. Here comes the delicious vegetarian steak recipe with cauliflower. 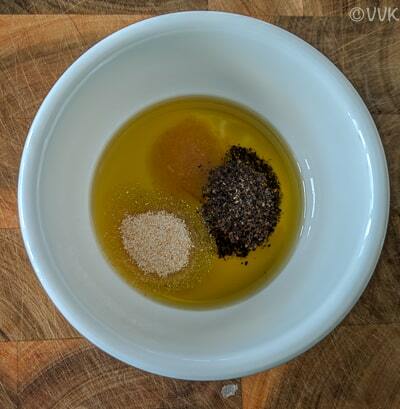 Mix the olive oil, salt, pepper, and onion powder. 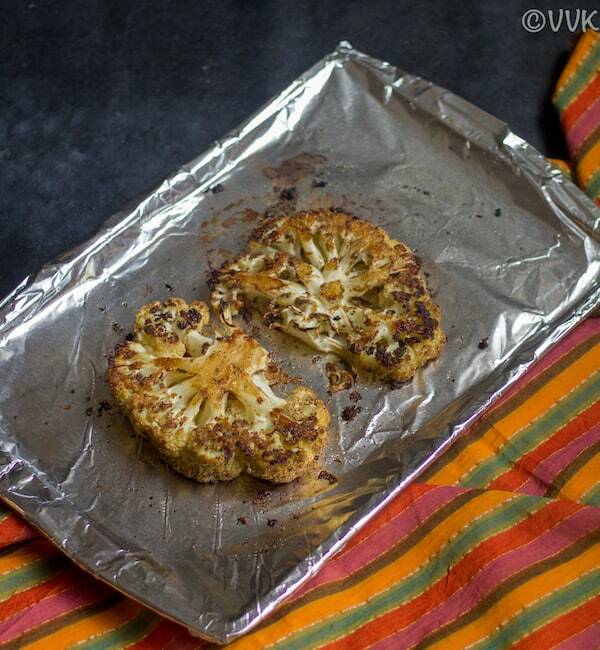 Place the cauliflower steaks on a baking tray lined with an aluminum foil or parchment paper. 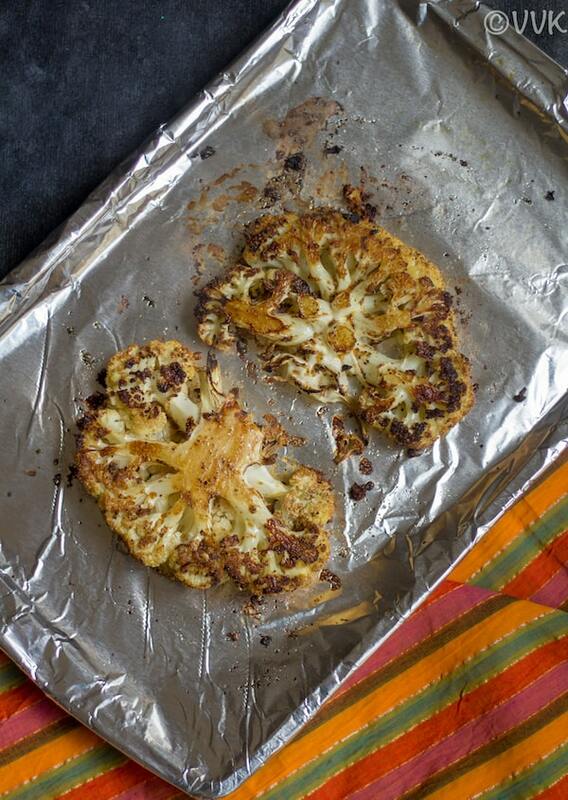 Brush the cauliflower steaks with the olive oil mix. Bake it at 400 deg F for 15 minutes and remove it from the oven. Gently flip the steaks and brush the other side with the olive oil mix and bake it again at 400 deg F for 15 minutes. 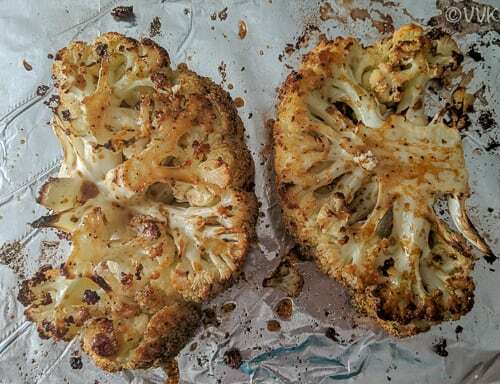 Now reduce the oven temperature to 350 deg F.
Brush the cauliflower steaks with the vegan Worcestershire sauce and bake it 350 deg F for 5 minutes. Carefully flip the steaks, and brush the other side with the sauce and bake it again for five more minutes. Serve it hot with the spinach salad. You can use any sauce of your choice and make this steak. Gently flip the cauliflower while baking. We want the florets to stay intact. 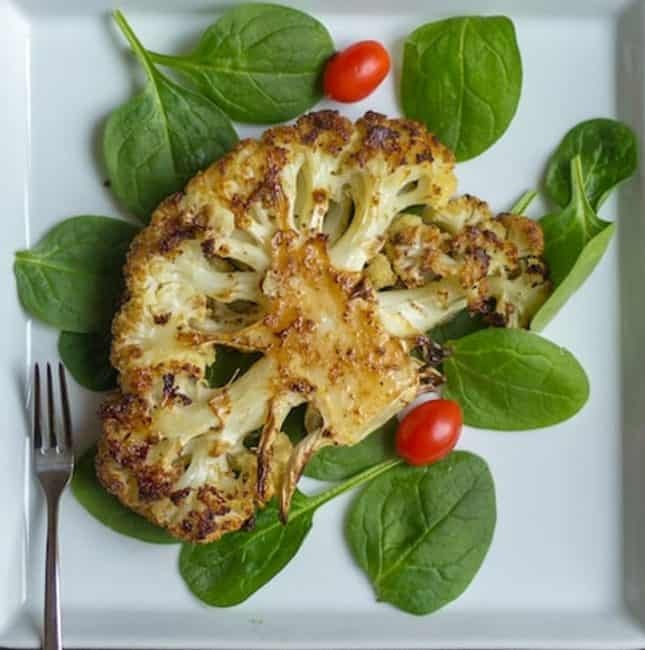 Crisp and tender roasted cauliflower steak with vegan Worcestershire sauce - the vegetarian version of the steak recipe with cauliflower. never knew that Worcestershire was made with anchovies – would never have thought that – Great twist on the steak! Thanks. oh yeah, they get the umami flavor from the anchovies. My boys love roasted cauliflower and beg me to make it often. I will make this next time as they look so pretty and also so easy to serve. 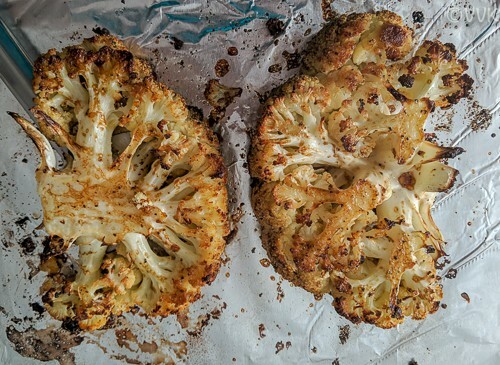 That cauliflower is beautifully roasted and I bet cauliflower lovers would enjoy this. Wow Srividhya, that roasted cauliflower looks excellent, and thanks for the tip for Worcestershire sauce sub, would surely make it.. Thanks Valli. I hope you like it. Wow! Looks fantastic. It has been on my to-do list forever now. Should try it out soon. Please do try Harini. You will definitely love it. 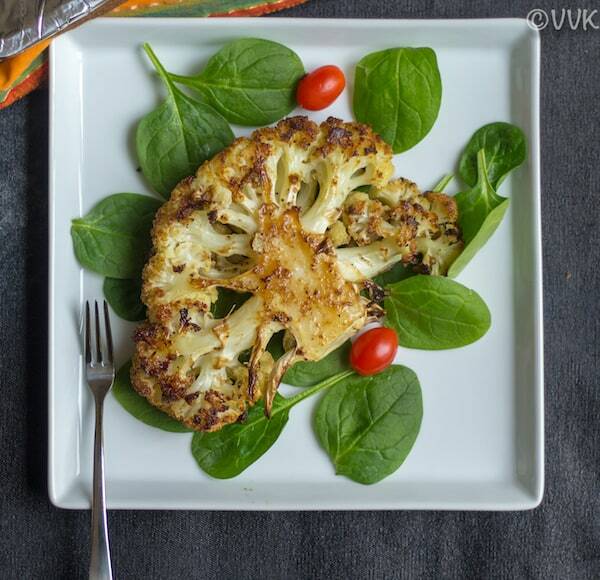 I love to make cauliflower steaks like quite often, you should try with soya sauce, its our family favourite. Cauliflower steaks looks ultimate. Sure will definitely try it out. 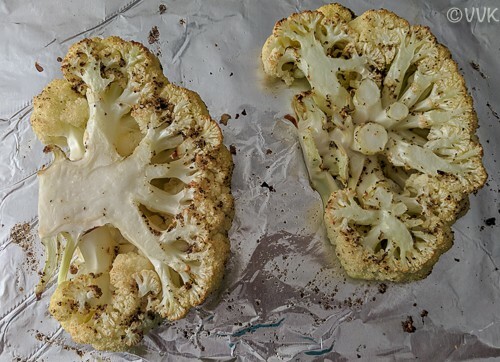 That is a beautiful roasted cauliflower Vidya. And sounds very flavourful with the sauce. It would make a nice meal option in low carb diet. Roasted veggies always taste so good. The flavors you used sound amazing. Must have tasted great. Yes, Varada. We enjoyed it a lot.